"The wolf thought to himself, what a tender young creature. What a nice plump mouthful..."
Hitting our screens before Once Upon A Time, Grimm gives us a darker take on our favourite fairy tales by literally embedding them in the real world and, being written by the people who brought us Buffy, the show manages to blend the lines of real life and fantasy superbly. 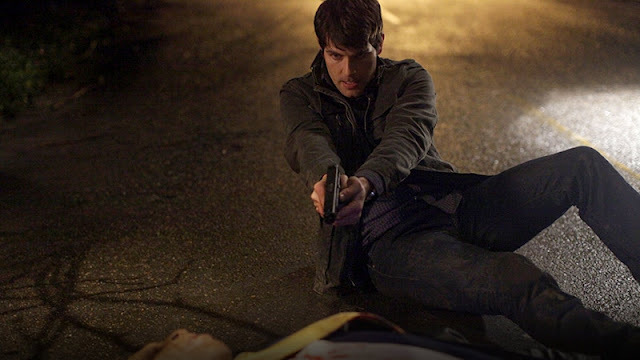 The show focuses around homicide detective, Nick Burkhardt, played by David Giuntoli who leads a normal life with his long term girlfriend Juliette, played by Bitsie Tulloch. His friend is his police partner, the tough as nails Hank Griffin, (Russell Hornsby). His life is completely normal until his mysterious and beloved Aunt roles into town and Nick's life begins to get difficult. He begins to see many ordinary looking people suddenly change into beasts and monsters. Most people would surely freak out but Nick seems to let it go over his head. But there is a reason behind these strange occurrences. He learns from his dying Aunt that he is a Grimm. That explains the sightings he has been having but not what he is supposed to do about it. It turns out he is supposed to protect human's from the fairy tale creatures that live in the real world. The pilot isn't too precise in what it entails being a Grimm and it works in the series' favour that it doesn't as this enables us to learn along with Nick, just what being a Grimm is all about. While the pilot still manages to give us a lot of exposition in a short amount of time, none of it feels rushed and it is up to a reformed sort of werewolf, Monroe, (Silas Weir Mitchell) to explain this strange world of mythical creatures to our Grimm. But Monroe also does the much needed job of injecting some humour into a series that otherwise would be too intense. But make no mistake, from the opening scene, this isn't a cuddly television show, it's a police drama with mythical elements thrown in. While it's not as procedural as say, CSI, the basics are still there. I think its safe to say that what has made Grimm so popular is the feeling of cohesiveness, there are no silly costumes or fantastical settings and is completely grounded in reality. The special effects are seamless which helps with the illusion that whatever is happening on screen is real. Also noticeable is that this is shot like a cop show were everything is harsh and gritty, they've skipped the fairy dust and I hope that never changes. So, unlike Once Upon A Time, which premiered the same year as Grimm, Grimm doesn't have what you would call a natural ending. The pilot doesn't end with the hero being given his quest, he is trying to learn what being a Grimm is. He learns his special powers but still has the time to learn what to do with them and the storytelling hasn't been painfully stretched out here. What the pilot does successfully do is set the show up for interesting avenues to explore. And judging by the fact, they have been commissioned for a sixth series, those avenues have been spectacular.